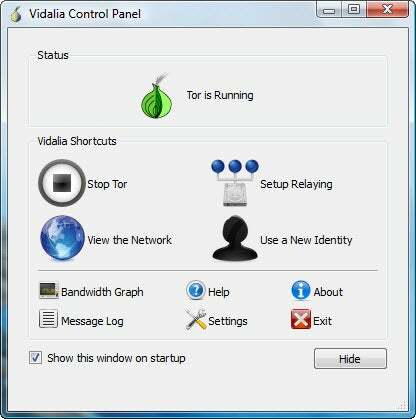 To keep these pieces of information private, try Tor, a free program that protects your anonymity as you surf. Tor takes all of your Internet communications, including instant messaging and other Internet applications, and sends them around a large network of "onion" routers that are Tor servers, making it impossible for sites or people to invade your privacy. The Tor download includes other software that you need for maintaining your privacy--notably Privoxy, a proxy program. The programs work well together; and because the software self-configures, they are simple to use. Tor runs in your system tray. To become anonymous, right-click the icon and choose Start. From that point on, you'll be&#160;anonymous. 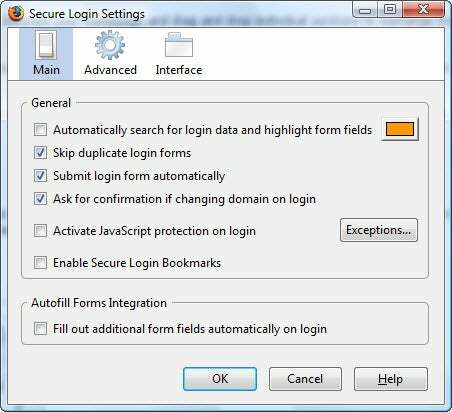 To stop surfing anonymously, right-click again and choose Stop. You can even change your Tor identity for maximum cloaking. 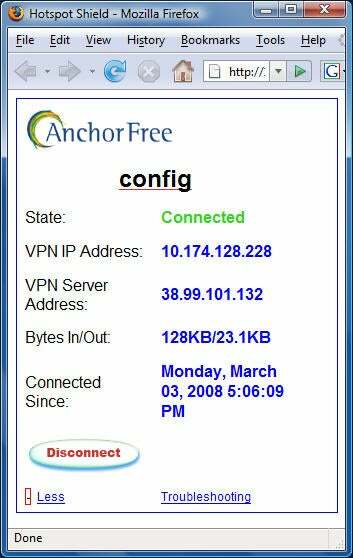 Hotspot Shield sets up a virtual private network (VPN) for you and encrypts all of your data so that it can't be read. It works in much the same way as the VPNs that companies use for their remote employees. Hotspot Shield is quite simple to install, set up, and use, with one caveat: During the installation process, you must make sure not to let the Dealio toolbar be installed. It's adware that has nothing to do with how the program works, so choosing not to install it won't have any adverse effects. When you first launch the program, your default browser will launch and display an ad. But you can close that window and continue to surf safely. With so many thousands of Web sites, though, how can you know which ones are safe and which ones aren't? MacAfee SiteAdvisor does a great job of letting you know. Perform a search in Google or Yahoo, and in each of the search results you'll see an icon that rates the safety of the site. A red X warns you that it's a dangerous sites; a green check means that it's safe; and a yellow exclamation mark means that it's questionable. Hover your mouse directly over the icon, and a pop-up will appear, informing you of what might be dangerous about the site. It details whether the site has dangerous downloads, whether the site sends spam to you if you register on it, and whether the site includes links to other sites that are known to be dangerous. To get even more information, click More Info on the pop-up, and you'll receive a detailed list of the dangerous downloads, as well as what malware or adware infects the site. Best of all, Site Advisor works when you browse sites, too. The software displays a small icon at the bottom of the screen as you surf. The icon warns you when you hit a dangerous site. One&#160;great thing about Firefox is the large number of add-ons available to improve your browsing experience. The options include&#160;plenty of privacy-related add-ons. These&#160;three are among the best. For&#160;Firefox users there's a simple answer: a free extension called NoScript. NoScript lets you turn scripts, plug-ins, and other interactive elements on or off at will, leaving them turned on at some Web sites and turned off at others. It protects against dangerous cross-site scripting attacks, too. The extension offers a remarkable amount of control, permitting you to customize which scripts and extensions to allow on a per-site basis. 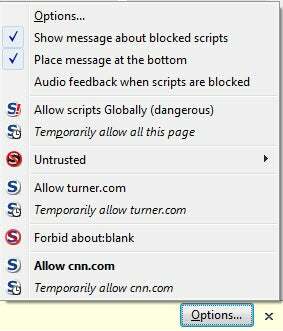 You can also block sites temporarily or permanently on each site. This Firefox add-in works in&#160;much the same way as the McAfee Site Advisor. 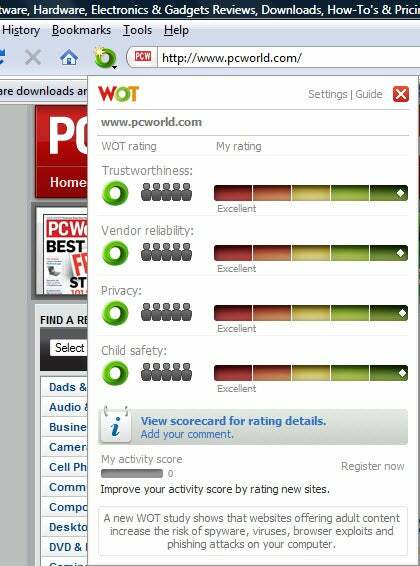 WOT rates sites according to their privacy, security, and trustworthiness, from Excellent reputation to Very Poor reputation, and it displays an icon next to the Address Bar indicating how it rates a particular site. As you search, you'll be able to see the icon as well, so that you can decide before visiting a site whether you want to go there.